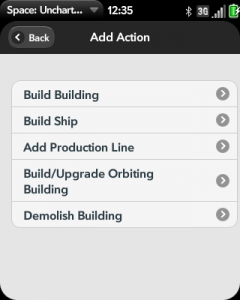 Clicking on the queue button when a unit (fleet, planet, or shipyard) is selected brings up the Queue. The queue allows you to give each unit a list of actions to perform. As a result, you don't need to check on your units as often, because they will perform each action in the queue in turn. If the unit has multiple actions in its queue, the action it is currently performing will be colored white. When finished with that action the unit will then begin the next action in the queue. Note that changes to the queue do not take effect until you exit the queue! Orders are added by tapping the ( + Add ) button. 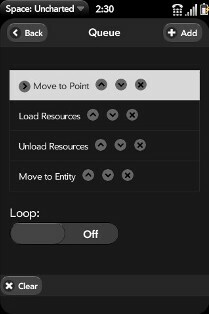 Simply touch the button and select the order you want to give to your selected unit. Some orders require you to select a spot on the map or select a unit. If the unit needs to move to follow its orders it will do so automatically. If you need to move an action up in the queue tap the up button. If you need it to go down tap the down button. If you just need the order to happen in the same place in line but want it to happen now just tap the order in the queue you want and it is now the one that is active. To delete an action tap the X button. To clear the entire list of orders tap the (x) button. You can clear all actions from the queue by tapping the (Clear) button. When this order is selected it opens the map and ask you to double tap where on the map you want your unit to move to. You do not have to pick a spot on the current screen. You can zoom in or move around until you have the spot you want your unit to move to. When this order is selected it opens the map and ask you to double tap an entity. This would be any fleet in the game, any planet, and any wormhole. When a fleet/planet/wormhole is selected the unit moves until it reaches the unit. The exception to this is a wormhole. The unit will move to the wormhole and than through it. At which point the unit stops on the other side unless you have selected another order for it to move. This order requires a Colonizer to be in your fleet. When the unit colonizes a planet it is consumed to build a mine on an empty planet. Tap the order, wait for the view screen, find a planet and double tap. The colonizer will move to the planet by its self. This order requires a Transport to be in your fleet. When selected wait for the view screen, choose a fleet/planet/space dock that you own. Unit will move, load (at a predetermined rate and amount depending on what level your transport and the size of your fleet) then wait for your next command. 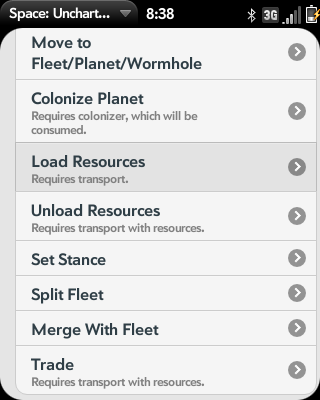 Note: the more transports in a fleet, the more resources you can carry, the faster you can load your transports. This order requires a Transport to be in your fleet. When selected wait for the view screen, choose a fleet/planet/space dock that you own. Unit will move, unload (at a predetermined rate and amount depending on what level your transport and the size of your fleet) than wait your next command. Note: the more transports in a fleet, the more resources you can carry, the faster you can unload your transports. Tapping this order opens a pop up menu with options to tell your fleet what to do if an enemy is sited, attacks, or in the area. These orders are standing and do not change until you change them yourself. As with most orders they take time to get to the units. So when changing stances remember to allow time for them to change. 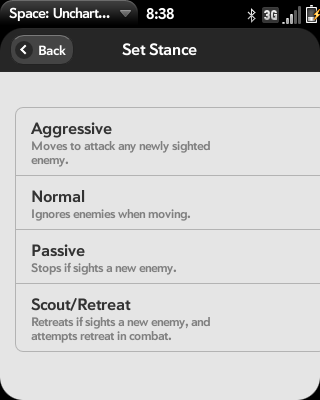 The menu and definitions of the different stances are below. When in this stance a fleet automatically sets its self to Move To Fleet when an enemy come into its radar range. This brings your fleet into combat range allowing you to guard or protect a certain area. This standing order ignores all enemy fleets and keeps moving unless it comes into combat range of an enemy Unit. When in this stance your fleet will stop moving as soon as a new enemy unit is spotted. This is good for avoiding a fight or staying out of radar range of a smaller unit. When you select this stance, the selection map will open for you to select a planet in the sector your fleet is in to retreat to. When in this stance your fleet will retreat to this planet if it spots a new enemy unit. In addition, when in combat, your fleet will attempt to retreat to the planet you have selected. Note:: Retreating from combat is not instant. The fleet will have a small chance of retreating each minute, regardless of size, etc. In a regular game, it works out to about a 25% chance of retreating in 1 hour, about a 50% chance of retreating in 2 hours, and a 70% chance of retreating in 4 hours. When the fleet successfully retreats, it will move to the planet you have selected. As in any conflict there will come a time that it is necessary to split your fleet. When you tap the Split Fleet button another menu will pop up. The numbers to the left are your current fleet. The numbers to the right are the new fleet. The single arrow moves one unit at a time to the new or old fleet. The double arrow moves fifty at a time. Note :: You have to hit the back button to finish, and you have to exit to the main screen for the order to go though. 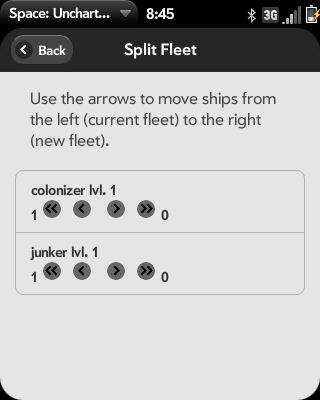 This allows you to select a fleet to merge your current fleet into. This order when given brings up the view screen to select which fleet, (in the current sector) to merge your current fleet with. Trading is currently disabled while the trading system is being updated. This order REQUIRES at least one transport, one Trade Post on one of your planets, and one of your allies to have a Trade Post. by the planet. The following steps will explain how to trade. Queue a trade order and select your planet with a Trade Post. Now when the transport arrives at your alliance members planet it will pick up and drop off resources specialty created for the trade they are not taken from your or your allies stockpiles. As for the amount you or your alliance member gets for a trade depends on a couple of things. Trade Post your alliance member owns. In basic terms this is what that means. The more resources you start off with, the farther you travel, the higher both Trade Post, and the more resources in the Trade Post's resource pool are the more resources you both gain from the trade. 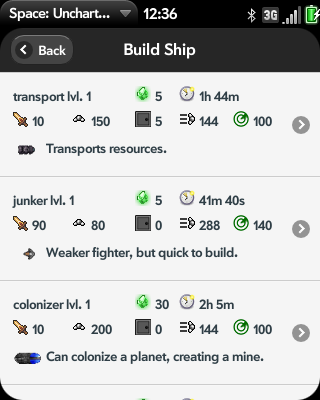 Your fleet is allowed to go over it's max resources as a result of a trade, so you don't need to leave space in your fleet for the trade profit. an alliance member you cannot take. to the previous alliance planet to trade with again. This is useful for supplying planets with resources faster than the planet can produce or when building capital ships from a Space Dock. There are 5 different types of buildings you can build, but only 4 buildings can be standing on any planet at one time. The buildings have to be built in levels. As the level of a building increases so does the length of time and amount of resources it takes to build it. Also as the buildings increase in level certain aspects of the planet change. Certain aspects changes are defense, sensor distance, amount of resources, attack abilities. This one is simple, select this to tear down a building already built on your planet. There are many different types of smaller ships aplanet can build, but before they can be built you have to establish a production line. Like buildings production lines have levels. The higher the level, the longer and more resources it takes to establish them. The production level can only be as high or low as the level of the factory on the planet. Note:: When a planet is destroyed by the enemy whatever production lines were established before the planet was destroyed remain established. The new owner just hast to build a factory. To the victor go the spoils! 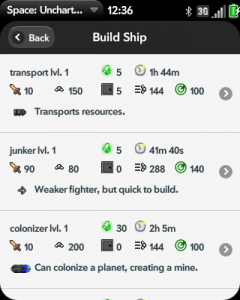 ship you want to build. Once those conditions are met you can build your ship. Ships are a little different than buildings. 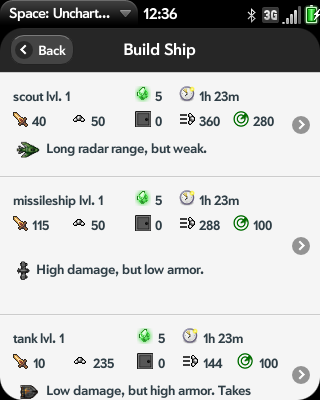 Higher level ships take longer to build and are stronger but the price of ships is based on the market. 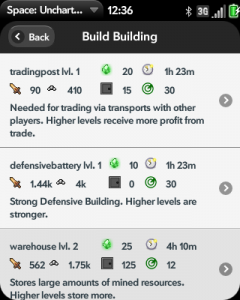 For example : a tank, today you�re the only person building tanks the price will be low. Tomorrow everyone is building tanks the price will be higher because more people are building them. 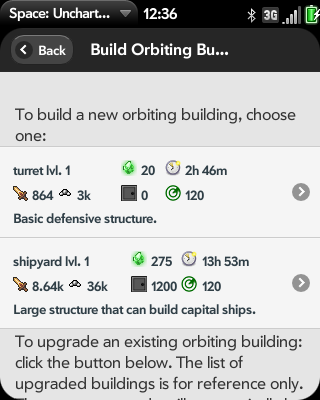 This option gives you a choice of building Turrets and Space Docks. To build tap it and the planet view will open. Next you have to select a spot to place it by double tapping the spot you picked. Orbiting Buildings can only be built inside of the green circle around the planet but outside of any red area within that green circle. After you have built you Orbiting building you may wish to upgrade it. 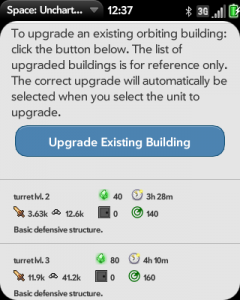 To do so select the Build/Upgrade Orbiting Building option. When the next menu pops up you will need to scroll down to select the Upgrade button. Once this button is tapped the view screen will open up for you to double tap the Orbiting Building you wish to upgrade. Just like Building and Ships upgrading takes longer and uses more resources each time you upgrade. There is a reference below the button if you would like to know how much, how long, and what�s being gained by upgrading. Just remember orders are NOT transmitted until you return to the main screen.